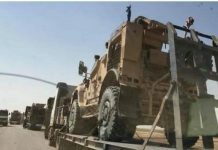 Russia began counterterrorist operation in Syria on September 30, after Moscow received an official request from Syrian President Bashar Assad. Initially, the military operation was conducted by a task force of more than 50 aircraft and helicopters, including the Sukhoi Su-34 and Su-24M bombers, Su-25 attack aircraft, Su-30SM fighters and Mil Mi-8 and Mi-24 helicopters. Last week, a decision was made to bolster the strike group with 37 new planes, including long-range aircraft carrying out sorties from Russian airfields. Even if Mossad/the Israeli AF blew up the Russian airliner, Russia can get back at them by destroying ISIS..
A safe investment for 2016: STOCKS IN EUROPEAN TRUCK COMPANIES. But 1000 trucks in 5 days… Why has Moscow’s generals bothered with chasing soft targets for 6 weeks?! District of Criminals and Pentagram dont hit “terrorists” as just a small part of their support for terrorists they create-train-fund, of course. the majority of Americans are clueless for being spoon fed psyop propaganda about everything, and the few that DO know what’s up are branded as dissident potential terrorists for wanting criminals OUT of the power seats in “government”. they have trashed our economy and global reputation, with most people clueless to any of it for decades of deliberate dumbing down. Regarding “clueless”, if the Kremlin is as clueless at it is, month after month, despite all of Russias combined institutions serving them with info and analysis, then one can’t expect more by our respective populations.